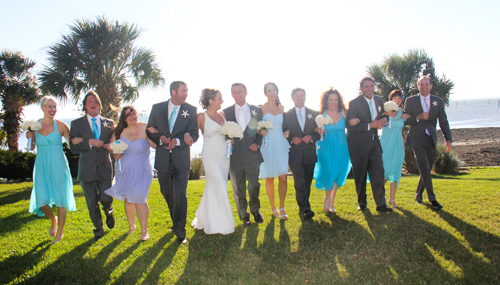 Wedding photography Sarasota FL – by PixelArt Photography. When two people are married, the formality, beautiful clothing, and breathtaking backdrop often makes them feel as if they are in a fairy tale and that for one magical day, they have become royalty. The setting of a wedding has a lot to do with making this type of magic, and for Kelley and Travis Detweiler of Apollo Beach, Florida, there was no better setting than the Powel Crosley Estate in Bradenton, FL. This backdrop, with its stunning architecture, bay views, and beautiful grounds, made this happy couple king and queen of their very own castle as they exchanged their vows in front of friends and family. Pre-Wedding Gifts at Powel Crosley Before the wedding ceremony and festivities took place, Kelley and Travis broke the tradition of the bride and groom staying apart before the wedding in order to exchange some special gifts with each other, such as a glittering pendant for Kelley and a handsome watch for Travis. 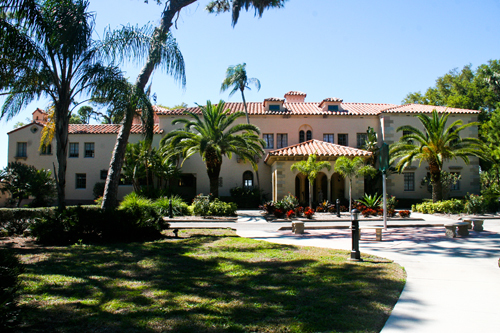 The happy couple exclaimed over their gifts and spent a few moments to enjoy the interior of the Powel Crosley Estate, which is also known as “Seagate.” This palatial mansion, which sits on the edge of the Sarasota Bay, was constructed in 1929 and was the perfect setting for the bride and groom to spend a few stolen moments together before the ceremony began. 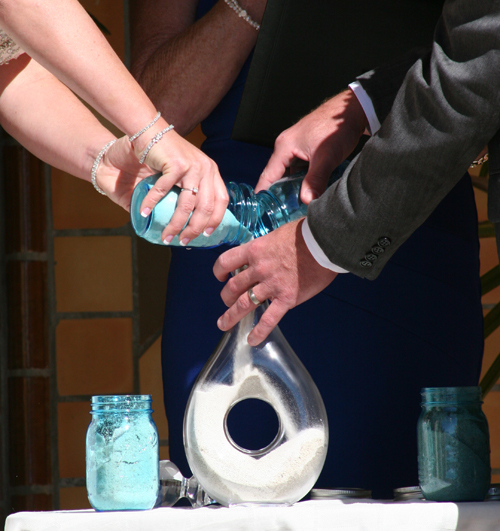 Sea-Themed Personal Touches for the Guests As guests began to arrive at the Powel Crosley Estate for a wedding by the bay, they were treated to a number of special touches that made the day even more special. The tables were set up with ocean and beach-themed accessories that included colored polished glass from the ocean, starfish, conch shells, a number of other seashells, and votive candles filled with beach sand. 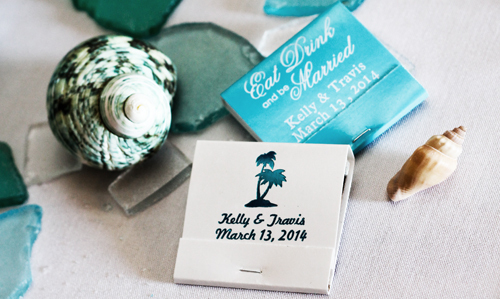 Sea-blue personalized matchbooks with the names of the bride and groom, as well as the wedding date of March 13th, 2014, were also scattered on the tables. The matchbooks proclaimed, “Eat, drink, and be married!” These clever little touches added to the festive air of the wedding as the guests assembled for the ceremony. A Ceremony of Sand As the ceremony began, Kelley and Travis performed a sand ceremony on the steps of the estate, in front of their guests, that would symbolize their unity as a married couple. Each poured jars of sand into a stylized container, which they would then keep as a reminder that their joining together created something completely unique. Once the rings were exchanged and the bride and groom took their first walk back down the aisle as man and wife, photos of the wedding party, family, and friends were taken on the estate grounds, which is famous for its lush greenery. The bride and groom were spotted later in the mansion’s famous round wood-paneled ship room, where they posed for more photos. Later, as the sun began to set, the couple went down to the water’s edge to watch as they shared a few more intimate moments while the bay lit up orange and blue behind them. Dancing and Dodging Bubbles As Kelley and Travis began to celebrate their first evening as husband and wife, the Powel Crowley Estate became a wonderland of lights and sound. 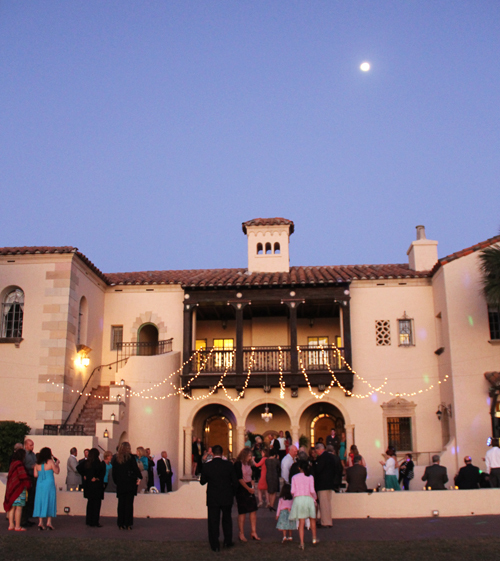 The guests enjoyed dancing on the roomy outdoor patio as cool ocean breezes wafted in from the bay. Glittering strings of lights and sand-filled votive candles flickered on the patio’s edge. The lights added an element of magic to the atmosphere and only enhanced the fairy tale setting. 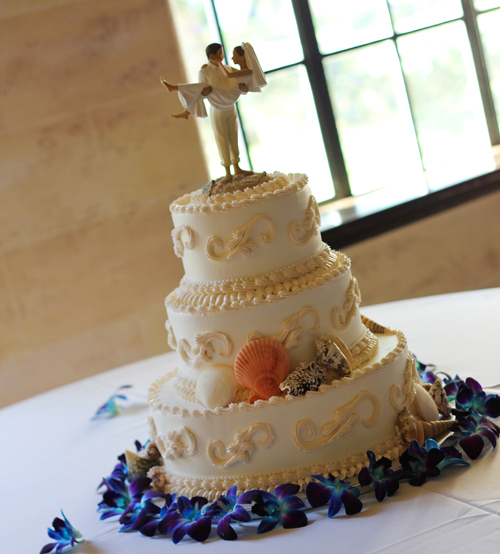 Once the bride and groom cut the white three-tiered cake, which was adorned with edible seashells and surrounded by purple and blue orchids, the happy couple was seen off to their new life with a sea of soap bubbles created by their guests, a way to wish Kelley and Travis that whatever the future held, the hope was that their troubles would be as light as air. 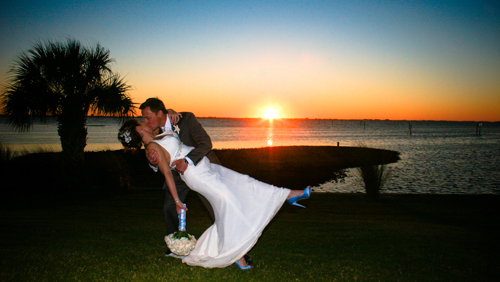 This fairy tale wedding, which took place on the stunning shores of Sarasota Bay at Powel Crosley Estate, is one that will never be forgotten by all of those who attended. 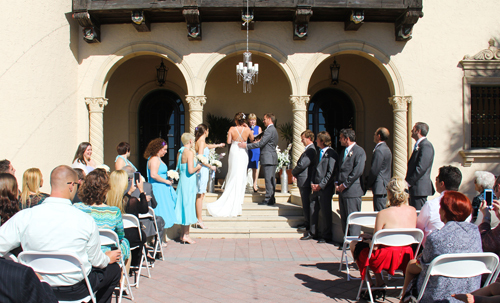 From the beach-themed décor to the formality and tradition of a ceremony at this lovely manor, the memories will last forever. 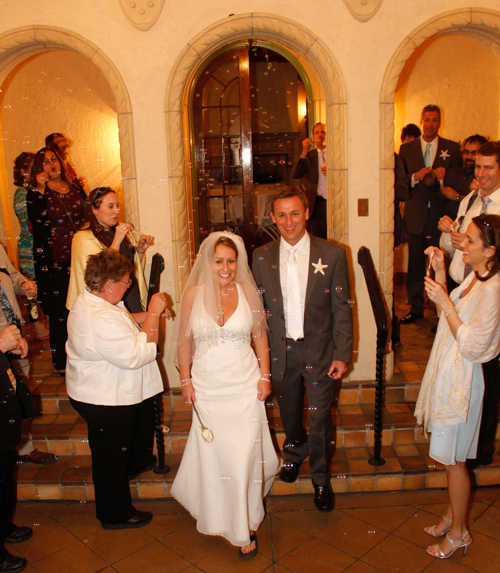 Summary: The setting of a wedding has a lot to do with making fairy tale magic, and for Kelley and Travis Detweiler of Apollo Beach, Florida, there was no better setting than the Powel Crosley Estate in Sarasota / Bradenton, FL. All photogrpahy by sarasota wedding & engagement photographer PixelArt Photography.